When travelling the world, the costs quickly stack up, so it’s important to try and make savings wherever possible. Accommodation is, of course, one of the biggest costs, so many travelers are turning to Airbnb to try and catch a bargain. The home sharing site allows users to book various forms of short-term accommodation across the globe and often works out a lot cheaper than traditional hotel rooms, but just where are Airbnb rates the cheapest? 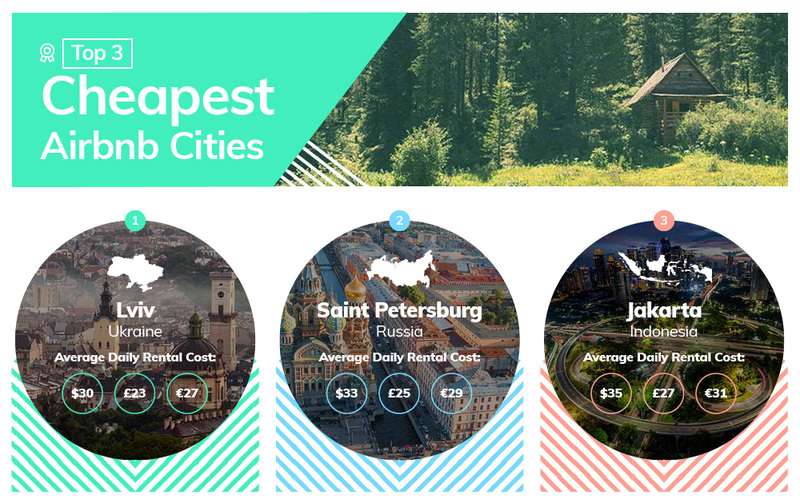 We’ve compared the cost of a daily stay at an Airbnb in some of the world’s most visited cities to find out. We hope this has given you some inspiration for your next vacation. We looked at the 100 most visited destinations in the world according to Euromonitor International’s Top 100 City Destinations 2018. For each, we took the average daily Airbnb rate (average nightly rate plus cleaning fees) according to AirDNA (correct as of April 2nd 2019). Note: For some cities, data was only available for the wider region. For example, for Punta Cana, data for La Altagracia Province was used. Three cities (Dammam, Chiba and Batam) were omitted completely due to lack of data. Be sure to check out our deals on cheap flights here at Globehunters, or get in touch with one of our travel consultants who will help you sort everything from flights and hotels to car hire.